This post was originally published here on Pedagoo and what follows is an updated version, with pictures!!! For the same reason as above I chose to attend another session based on assessment, this time Chris Curtis’ “The link between planning, progress and marking.” He started his talk by asking whether books actually tell the story of how a student is taught and of their learning. This again is a key topic in the days of work scrutiny and book checks. His use of the magician mastery and leaping up the ladder analogies were spot on and ones I will be using with staff and students alike. As part of an activity during the session I wrote down two very prosaic sentences on London and then managed to self-mark using a very clever grid of 15 targets to improve my work; unlike the famous Paul Daniels quote I liked this idea a lot! During Crista and Candida’s presentation they had a slide with a scale from the seemingly interchangeable Nicky Morgan / Michael Gove Tory Secretary of State for Education to Sir Ken Robinson. Perhaps my difficulty in digesting the mention of “Shift Happens”, “jobs that don’t exists” and “digital natives” would put me squarely at one end of that spectrum? However, that is not the point and I took many fine ideas from this session. Indeed it was a celebration of enthusiasm, hard work and, above all, passion for the job. Whilst listening to both Candida and Crista speak the sheer love they have for student learning come across loud and clear. Grassroots Leaders and Research-Focused TLCs was next on my list from Athena Pitsillis and Keven Bartle. I particularly liked the idea of pedagogy leaders as “brokers” between SLT and teachers and this made me think how it felt to be in such a position. My initial thoughts of it being akin to metamorphic rock were allayed as the session progressed. One thing that struck me is the sheer volume of leaders that this approach develops, in some schools such opportunities are few and far between. This reminded me of the Multiplier Effect and echoed the theme that all teachers are leaders; I really would recommend this book to those who enjoyed the session. Finally it was also inspiring to hear Keven talk about how they have broken down barriers between teaching and support staff; as a teacher that relies on two excellent technicians I heartily agree that we should be doing more to develop the roles of support staff within schools. 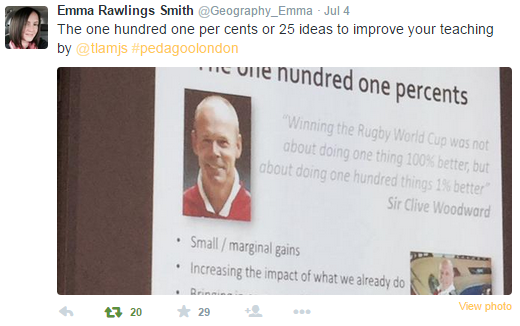 The final official part of PedagooLondon was Summer Turner’s summary of the day. This was particularly apposite as she called for more autonomy and empowerment in what we do as well as encouraging debate to help allow opinions to form. This talk embodied the collaborative nature of the event and called on maintaining the positive activism. Thank you to all who were involved in organising such a fantastic day! The tweet below sums it up nicely, click on it if you would like to share this post. This entry was posted in Uncategorized on July 8, 2015 by tlamjs.